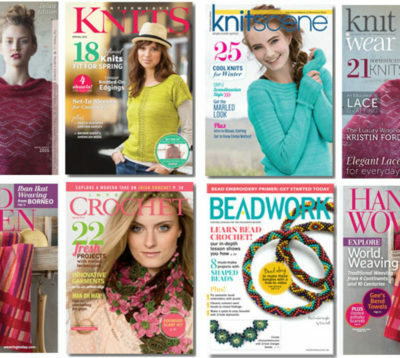 Connect with fiber enthusiasts, beaders, and jewelry makers through Interweave’s publications, digital properties, and events. Contact our media sales representatives for more information on how you can sell more to your best prospects and customers! Titles include: Interweave Knits, knitscene, Interweave Crochet, PieceWork, Knits Holiday, knit.wear, Knitting Traditions, WOOL STUDIO, Interweave.com, and Knitting Daily newsletter, Crochet Me newsletter, and Needlework Traditions newsletter. Titles include: Handwoven, Spin Off, Little Looms, Interweave.com, Spinning Daily newsletter, and Weaving Today newsletter. Titles include: Beadwork, Jewelry Artist, Tucson Show Guide, Interweave.com, Jewelry Making Daily newsletter, and Beading Daily newsletter.